My Yare Scarf is named after the river that runs through the City of Norwich in the UK. The delicate stitch pattern is inspired by the intricate designs found on nineteenth century woven and printed shawls that were produced extensively in Norwich, Edinburgh and Paisley. These stunning shawls were originally inspired by extremely fine and much valued shawls from Kashmir which were imported into Europe in the mid nineteenth century. The history of these shawls is fascinating and some wonderful original examples can be viewed on the Costume & Textile Association website and also on display and in the online collections of The National Museum of Scotland in Edinburgh and the V&A Museum in London. 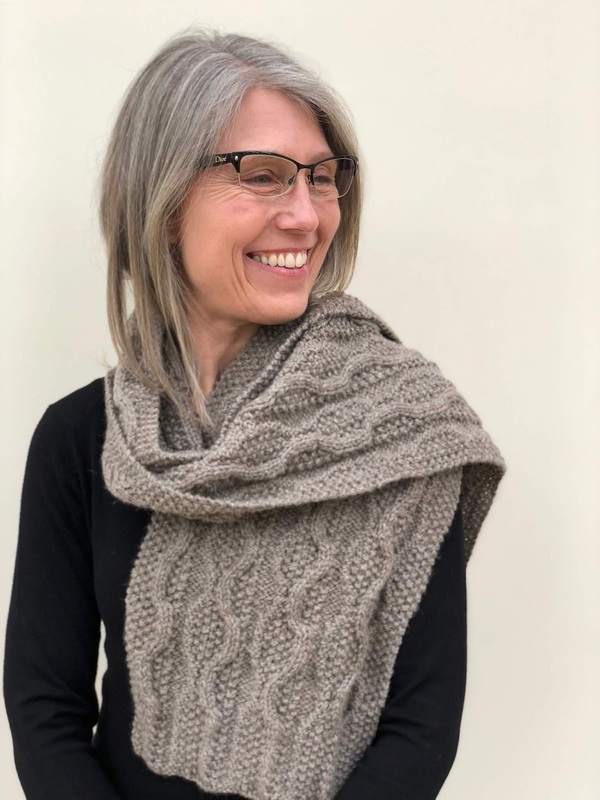 When I was writing my book, I immediately knew that my knitted Yare scarf design would be the perfect example to show the combination of short row shaping with twisted stitches. 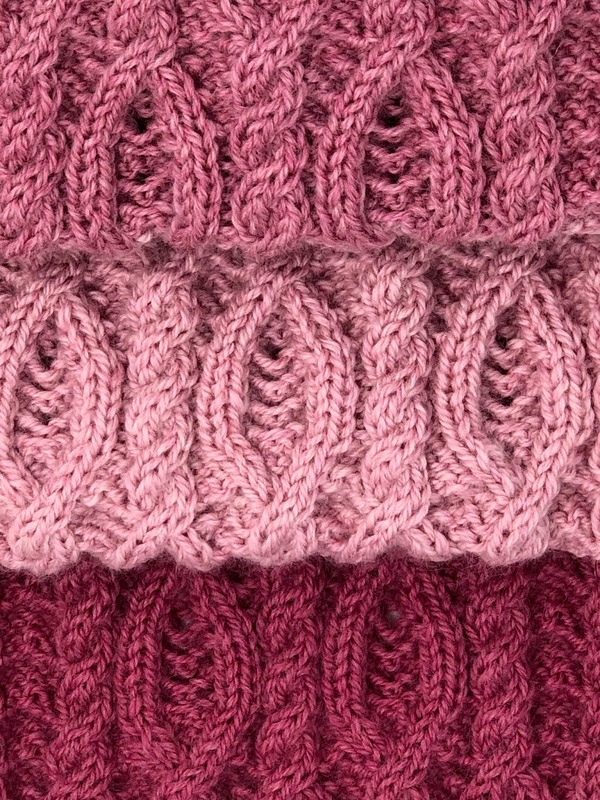 The short rows are used to give the scarf a gentle curve. The twisted stitches create a series of delicate motifs that change in scale as the scarf narrows from cast on to cast off points. 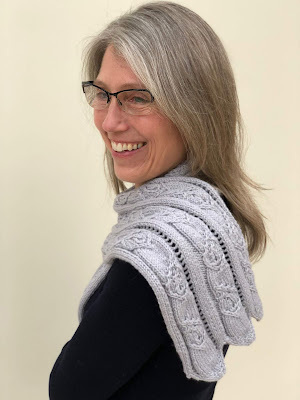 The Yare Scarf example also provides me with a great opportunity to write about the fantastic Stitchmastery charting software used throughout A Knitter's Sketchbook. I had constructed my original pattern for Yare with only written instructions and although this worked well, it was the addition of Stitchmastery charted instructions that really completed the pattern. The Stitchmastery software package allows knitters and designers to create their own knitting charts, along with written instructions. This excellent software really has become an integral part of my design process. Capturing my ideas with a chart helps me to translate my sketches into "knit-able" stitch patterns. If you have not yet taken a look at Stitchmastery, you can read more and download a free trial here. To help you get the most out of using Stitchmastery, there are a series of insightful blog posts, a Ravelry group and a some detailed YouTube videos. These excellent video instructions guided me through how to customise my own cable symbols which I then used in my Concrete Scarf pattern! 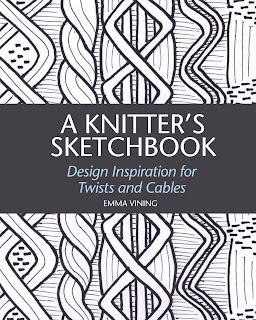 You can see more details about A Knitter's Sketchbook on the Crowood Press website and on Amazon! 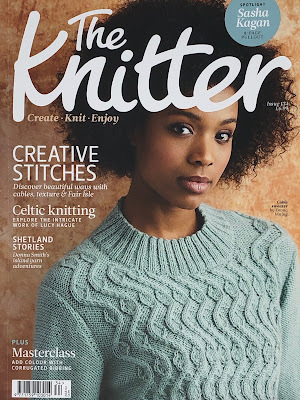 Knitting Magazine Review of A Knitter's Sketchbook! I am delighted that A Knitter's Sketchbook, has been reviewed in Issue 192 of Knitting magazine! 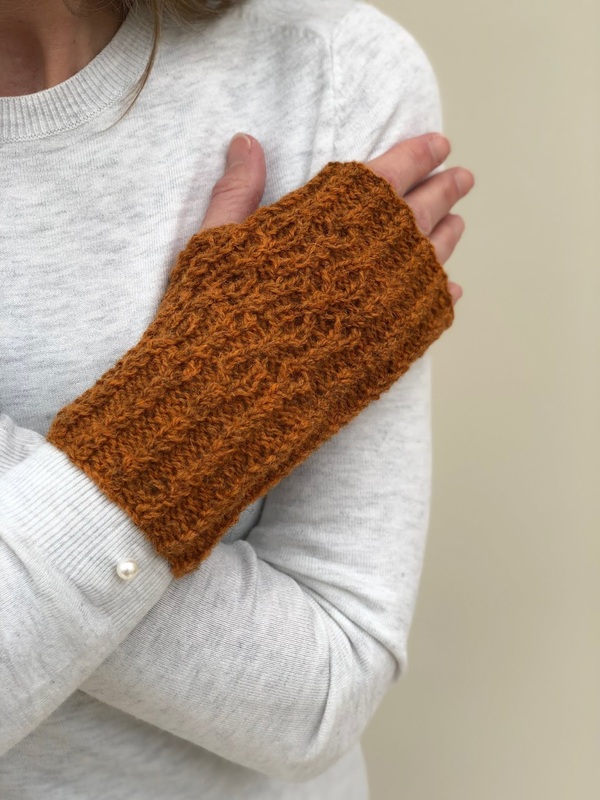 As well as giving an overview of the contents, this lovely review mentions my Stepper Wristwarmers, which you can read about here and my Concrete Scarf, which was inspired by the details and texture of a concrete wall. When I was designing my Concrete Scarf, I looked the underlying patterns and lines within a textured, solid concrete panel on the side of a building. 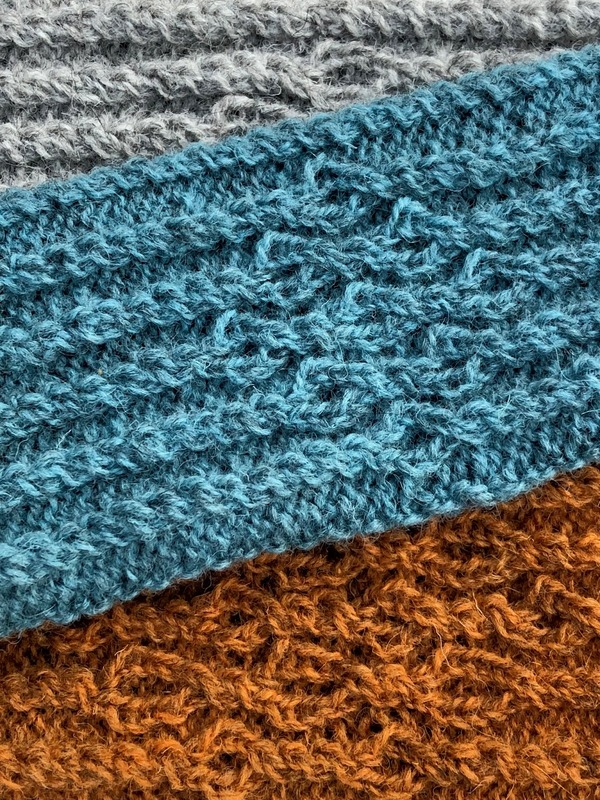 I used these elements to create a distinctive knitted stitch pattern for the scarf project. 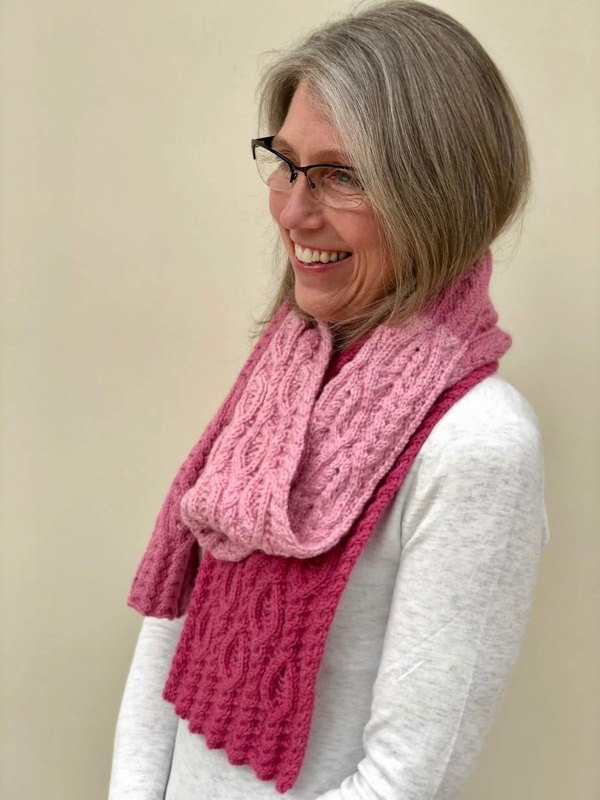 The result is a scarf that captures the look of the building wall, yet is soft and wearable, making it perfect to wrap around your neck and shoulders! 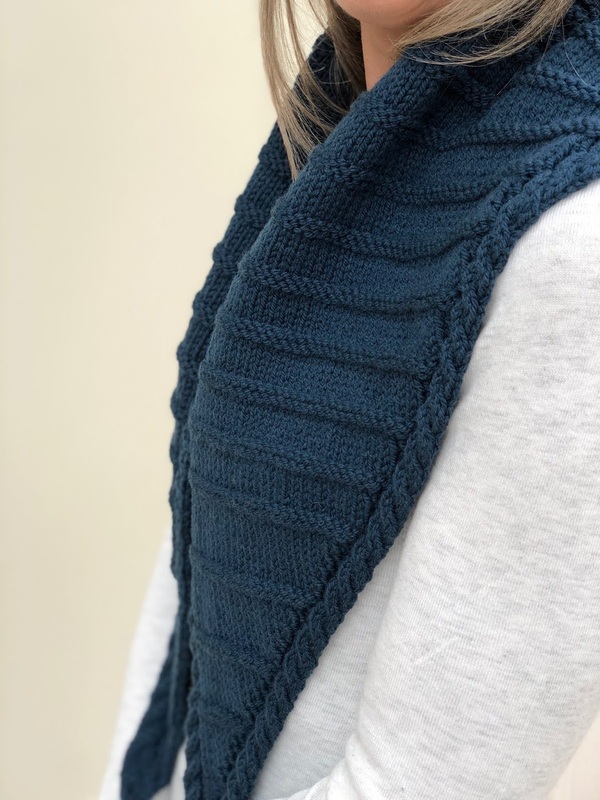 The scarf is knitted in West Yorkshire Spinners Fleece Aran, a yarn with just the right sort of structure to show off the cable movements in the pattern. 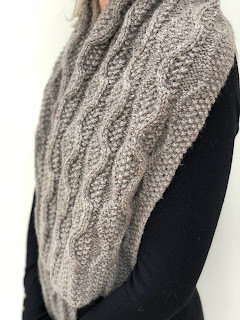 The combination of contrasting stocking stitch and reverse stocking stitch cables looks great in this lovely WYS aran yarn in the Light Brown shade. 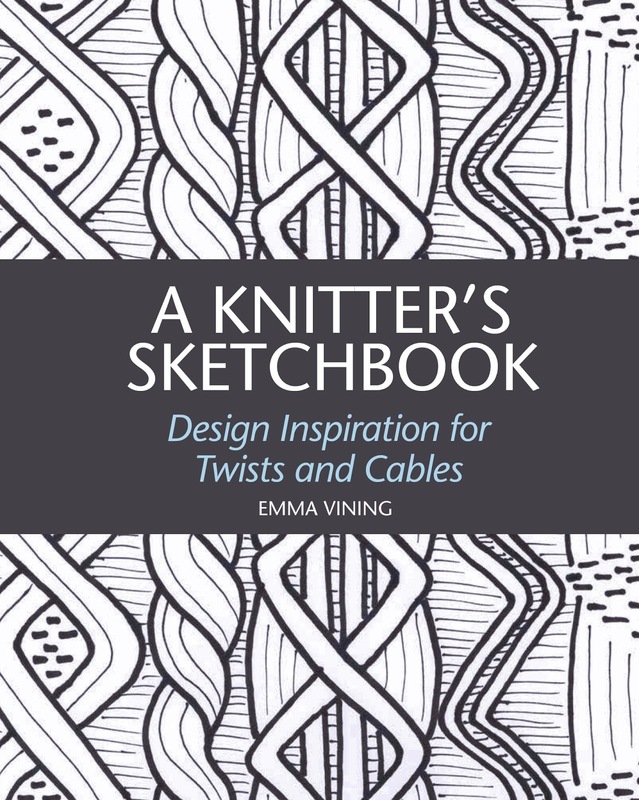 If you are enjoying my blog posts about the knitting patterns in my book, please consider buying a copy of A Knitter's Sketchbook from the Crowood Press, Amazon or other major booksellers. Thank you! 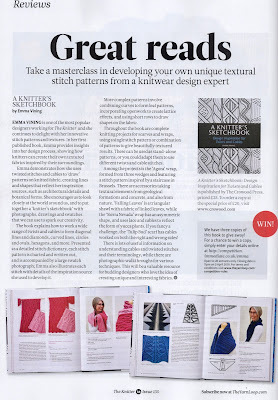 Review of A Knitter's Sketchbook in The Knitter Magazine! 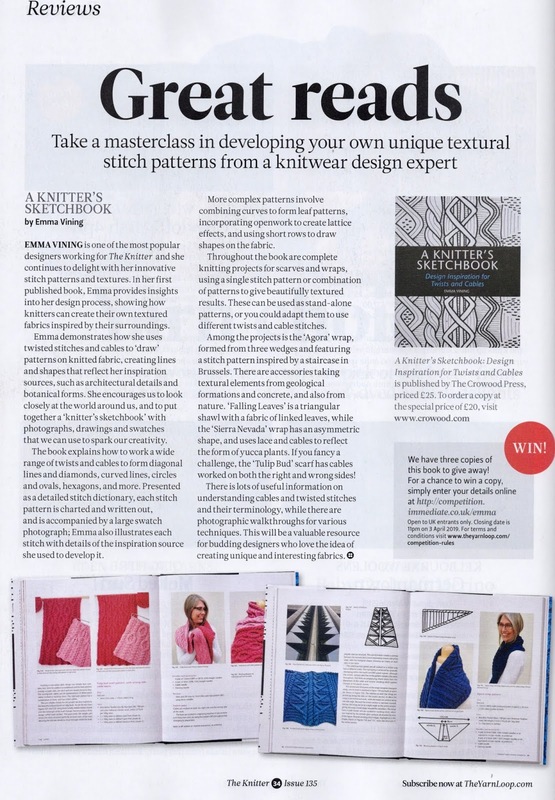 There is a lovely review of A Knitter's Sketchbook in this month's Knitter Magazine, Issue 135! Even more exciting, there is a free-to-enter competition where you can win one of three copies of my book. Why not give it a go by visiting http://competition.immediate.co.uk/emma! Closing date for entries is 03/04/2019 (see below for terms &conditions). I am over the moon about this lovely review. 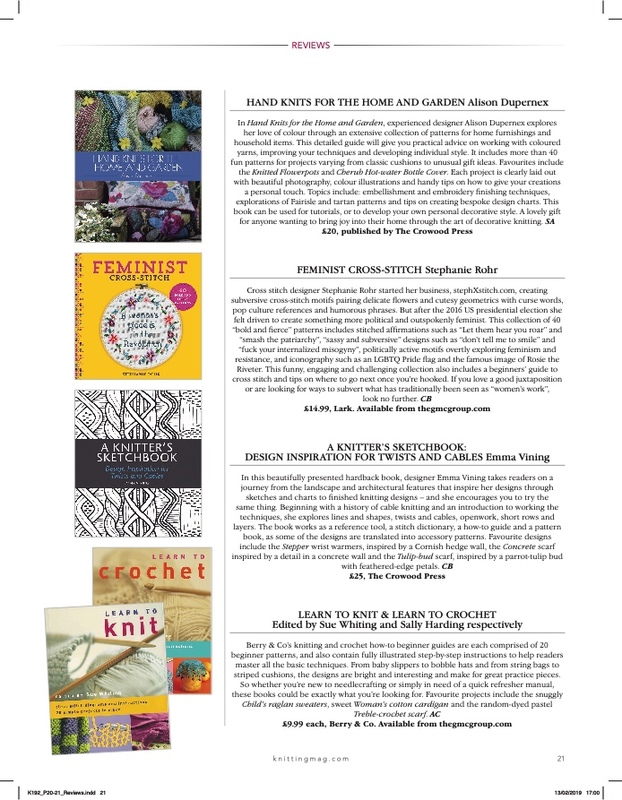 The Knitter Magazine has also published a few pages from my book so that readers can get a flavour of the contents. 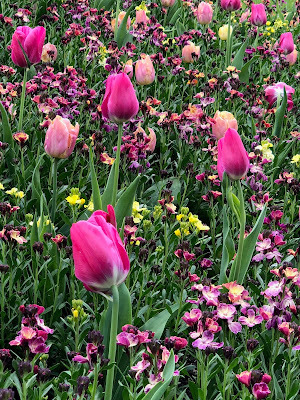 The projects featured include my Agora Scarf, which you can read about here, and my Tulip Bud Scarf. The Tulip Bud Scarf has a reversible stitch pattern that features cables on both sides of the knitting. The reverse side of each cable movement becomes part of the pattern on the other side. 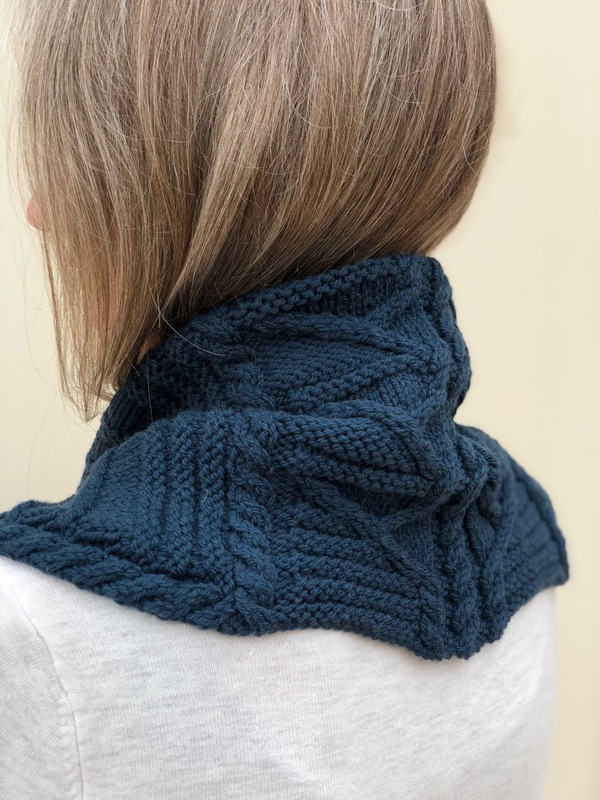 I loved designing and knitting this scarf as every stitch counts! 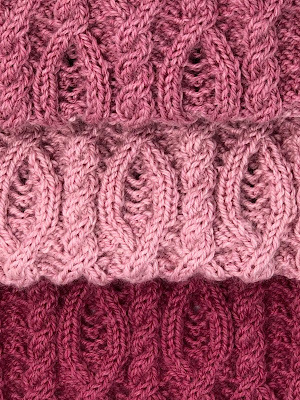 The beautiful yarn is John Arbon Knit by Numbers in three shades of the pink tonal run. I bought my very first pink tonal run at Edinburgh Yarn Festival a couple of years ago and since then, I have used this yarn for so many different projects! I love the way the shades work together to enhance the overall design. 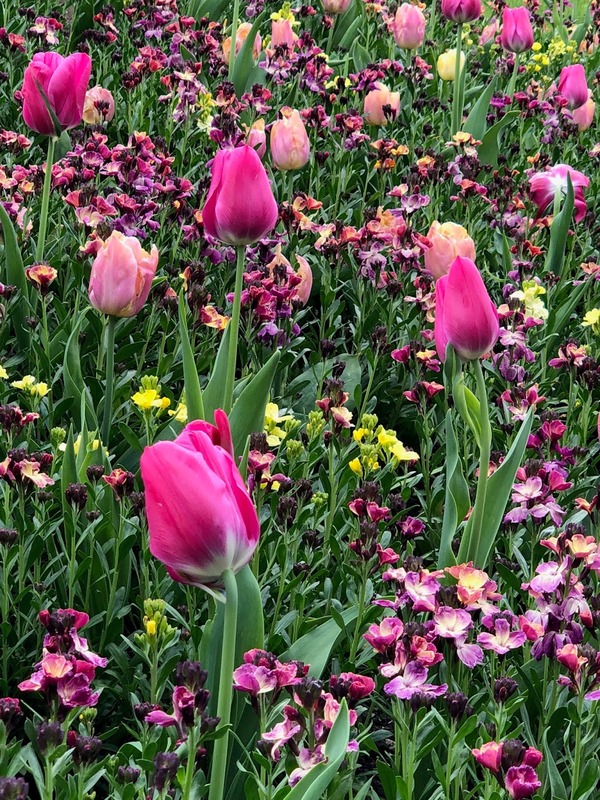 These three pinks, shades 64, 66 and 67, beautifully reflect the tulip inspiration for my scarf. Please note that the Knitter Magazine book give-away is open to UK residents only. Full terms and conditions available on the Yarn Loop website http://www.theyarnloop.com/competition-rules. The knitting pattern projects in A Knitter's Sketchbook all have very different inspirational sources. My Agora Wrap pattern was inspired by the glass facade of a staircase located in the heart of the European Parliament in Brussels, Belgium. The staircase facade appeared to be made up of a series of triangles and diamonds and the Agora wrap pattern combines these shapes in knitted cables and reverse stocking stitch ridges. The wrap is worked in three stages, beginning with the central cable panel. After this panel is completed, stitches for the two wings are picked up along the sides of the panel. Each wing is then worked outwards one at a time, decreasing to a point. The beautiful structured yarn is Brooklyn Tweed Arbor in the deep blue shade of Sashiko. Join me at Unravel in Farnham, UK on Sunday 24th February 2019 at 2.15pm to hear more about this project. In my talk "A Knitter's Sketchbook", I'll be talking about the Agora Wrap and other examples from my book to inspire you to create your own knitter's sketchbook! The Unravel Festival of Yarn begins on Friday 22nd February and is three days of fabulous workshops, interesting talks and wonderful exhibitors. Looking forward to seeing you there! My Linwood sweater design is the cover garment for this month's Knitter Magazine! 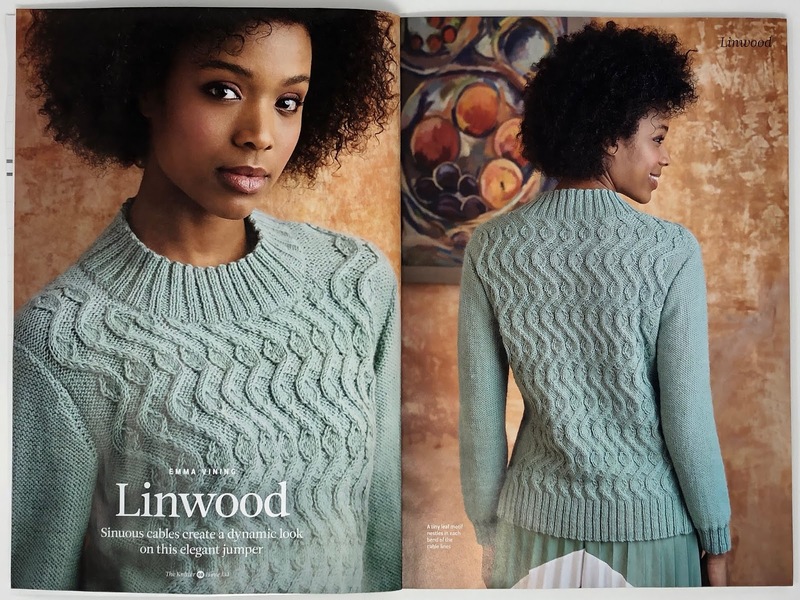 I love everything about this magazine issue, from the stunning model looking amazing in my sweater design, to the fabulous photography showing all the patterns at their very best. Having my design published alongside patterns by talented designers such as Jeanette Sloane, Carol Meldrum and Mary Henderson to name only a few, makes me feel so proud! 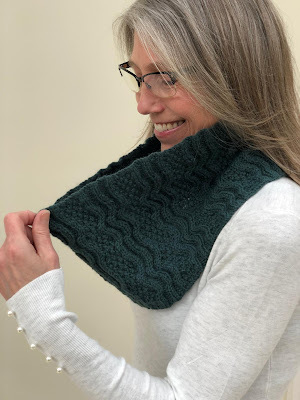 My Linwood sweater has a linked leaf stitch pattern that is similar to a rib-based design in the way that the curving cable lines run parallel to each other. A little leaf motif is tucked into the bend of each of the cable lines. 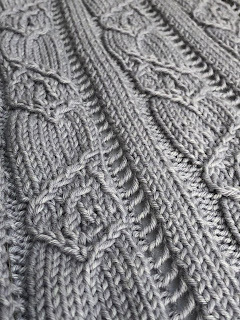 The whole cable pattern panel is placed centrally on the sweater. However there is an asymmetric look around the neckline, created as the cables move left then right alongside each other. The beautiful yarn is West Yorkshire Spinners Illustrious DK in the delicate shade of seaglass. As well as interesting reviews and news, there is a delightful article about yarn shop Ida's House, located in Caterham on the Hill. Owner Jayne has created a community based shop with a lovely atmosphere. 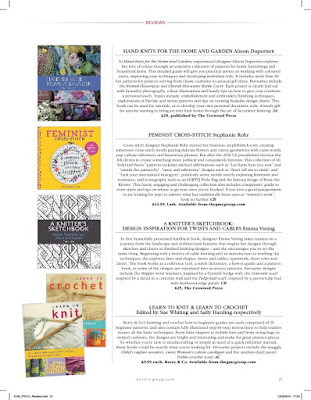 Also great to see Fiona Morris's Crowood Press book "Knitting with Beads" in the New Books list on p15! You can read more about this excellent issue over on the Yarn Loop website. In this post I would like to tell you about my Meander Cowl pattern from A Knitter's Sketchbook. 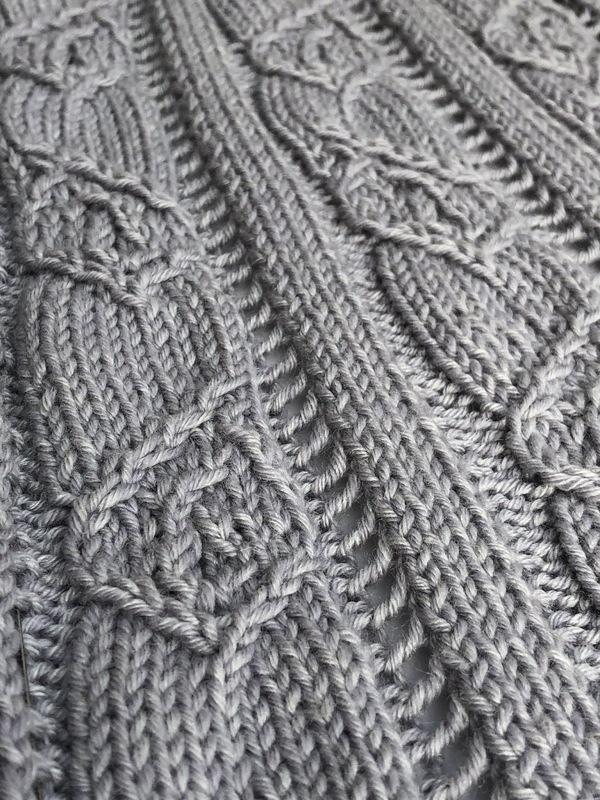 This design highlights the way a series of curved lines can be used to create stitch patterns in knitting. Meander was knitted in West Yorkshire Spinners (WYS) Illustrious yarn in the gorgeous dark green shade of Highland. This is the perfect opportunity to say thank you to WYS for their generous yarn support for this project. I knitted the Meander Cowl and several samples throughout my book in the lovely yarns that they sent to me. My inspiration for this design was a flowing river. In particular, I was very fortunate to be flying into Gatwick Airport on a clear day, and to also have a window seat. As we were landing, I took several photographs through the airplane window, capturing a beautiful series of meanders in a river flowing through a field below us. Over time, as the process of river bank erosion continues, the meanders will change and perhaps I will design a new stitch pattern to reflect this! You can find the Meander cowl pattern, along with my photo and sketches of the river in my book. The pattern has both written and charted instructions and can be knitted flat or in the round. Please take a look on The Crowood Press website or on Amazon, where my book is available to order as a hard copy or e-book. Thank you Birlinn Yarn Company! Working with gorgeous yarn was one of the best parts about writing my book! In this post, I'd like to say thank you to Meg Rodger of the Birlinn Yarn Company for her generous yarn support. I used Meg's beautiful yarn to design and knit my Wishing Well Wristwarmers patterns in A Knitter's Sketchbook. The stitch patterns for my Wishing Well Wristwarmers were inspired by a stunning ironwork water well cover located in the centre of the beautiful German town of Mainz. 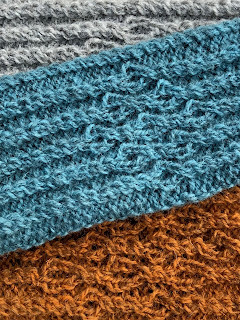 The wristwarmers are knitted in three shades of Birlinn Yarn 4ply, Reef, Moor and Storm Grey. Each wristwarmer begins and ends with a twisted stitch rib and there is a choice of three different stitch patterns. I designed options exploring ovals and circles, using twisted stitches to make the shapes. There are both charted and written instructions for your choice of pattern. Perfect to mix and match! There is a wonderful choice of shades of Birlinn Yarn available, from natural to Hebridean Colours. When I met Meg last year I could see all these stunning colours in the landscape around her home on the Isle of Berneray. You can read more about my trip to the Outer Hebrides here and read all about Meg and her beautiful yarns here.